> some disease at the time, but we all know what really happened. > her mind, now that she's wearing one constantly. > Don't have any new vids, but here are some more pix. At a guess I'd say that age was a major contributing factor behind her move to prosthetic use. 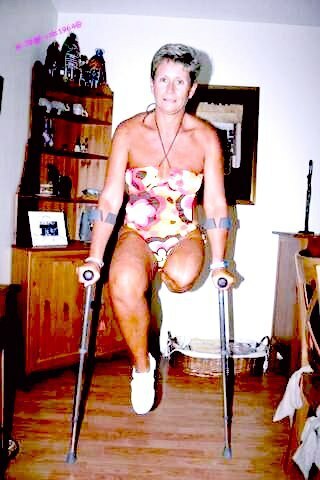 She's now 54 - not old, but not getting any younger - and getting around on crutches full time must be punishing both on the remaining leg and upper body. I'd say she's realised that she couldn't go on doing it for ever, plus all the legs you see her using are high tech, in your face advertisements of her one legged status - which she surely loves. The thing I've often wondered is whether her partner at the time of her successful transformation to being an amp was/is a) a dev and b) complicit in her actions? Firstly you are right. She did try to become a DAK with dry ice. She failed on both counts but her right leg was eventually amputated as it was so damaged. It appears she settled for being a SAK much to my delight. Yes her husband was aware and was with her when she tried to lose both her legs. He is not a dev as far as I know but realised she was suffering and wanted to be an amputee (she used to pretend and he knew about it) She is now using a pros because she is so into sports, paddle boarding, running, other water sports etc and has become quite a celebrity. I don't think it is because she finds crutches difficult. Her one concern was that her boys did not find out she was an amputee by choice and of course with all the publicity surrounding her these days she does not want it to become public knowledge either. Somewhere there is a vid of her crutching in Amsterdam, one of the last before she became a regular pros user. There is also an interview with her somewhere on the net (using a false name of course) in which she tells all about her desire to be an amputee and how it all happened. My dream lady! My apologies She's a LAK of course! I don't think she stopped at one leg deliberately. It looks like the scars on her good leg are the result of skin grafts where the dry ice didn't do the job. It would have been interesting to see her as a DAK. I had a few conversations with her when she posted on MySpace and asked her how she became an amputee. She put it down to some disease at the time, but we all know what really happened. She also said that she didn't want to wear a prosthetic leg. Wonder what changed her mind, now that she's wearing one constantly. Don't have any new vids, but here are some more pix. - which she surely loves. transformation to being an amp was/is a) a dev and b) complicit in her actions? Yes, in many ways a successful wannabe has to be the perfect amp, because they're living their dream. Personally I think she looks better in the more recent pics (with the more modern longer hairstyle) than ever. Thanks for the extra info. I was six when I first became aware of my desire to lose my legs. I don’t remember what started it – there was no specific trigger. Most people want to change something about themselves, and the image I have of myself has always been one without legs. To the general public, people like me are sick and strange, and that’s where it ends. I think it is a question of fearing the unknown. I have something called body identity integrity disorder (BIID), where sufferers want to remove one or more healthy limbs. Few people who haven’t experienced it themselves can understand what I am going through. It is not a sexual thing, it is certainly not a fetish, and it is nothing to do with appearances. I simply cannot relate to myself with two legs: it isn’t the “me” I want to be. I have long known that if I want to get on with my life I need to remove both legs. I have been trapped in the wrong body all this time and over the years I came to hate my physical self. As a teenager, in the privacy of my own home, I used to play by myself at being an amputee. I would pretend I had one leg, strapping the other one up behind me and wearing oversize trousers so there was no shape. I knew even then that it wasn’t normal, that it wasn’t something to share with friends or my parents. But, trussed up like that, I would be quite happy and satisfied for a while. At 23, I met my future husband and we were very happy together – but I was leading a double life. He did not know about my BIID at first so it wasn’t easy to pretend. I went through periods when having him around was very disturbing. I gradually withdrew into myself, becoming private and secretive. First I needed to freeze and kill the leg so that surgeons would amputate it afterwards. I ordered dry ice pellets from a company near Edinburgh (the same stuff that is used in discos for the smoke effect). Nobody asked what it was for. I bought 40kg – it evaporates very quickly, so you have to buy a great deal. I put on layers of pantyhose, because you do not want it sticking to you, spread it in the back of the car and sat with my leg immersed in it for one hour. The pain was indescribable: it hurt so much I passed out a few times. I was scared, but more so of failure. I am that kind of person – I never fail. I had not damaged the leg enough to have it amputated in hospital, so the following September I made a second attempt, and this time I stayed in the dry ice for four hours. I was sat with my legs across the back seat of the car, the windows wide open and the footwell filled with dry ice, covering the leg and topping it up as it evaporated. When I could bear no more I called my husband, who came and pulled me out. The leg was hard as stone. I had third-degree burns and the pain was horrible. But it wasn’t enough: I now know you need a minimum of six hours to kill a leg completely. My husband drove me to hospital, but they refused to amputate. Incredibly, they said the wounds were superficial and that I would be walking within a few months. I really thought this time that the surgeon would give me the amputation I needed, but they seemed resolute. I went through all sorts of stages as they worked on my leg to save it. Sometimes I found the whole thing very funny, at other times I was crying, and sometimes I didn’t think I would live through it. I reached my lowest point when they discharged me from hospital four weeks later, after eight sessions of surgery, with the leg still attached. I thought I was going to have to make a third attempt. But this time I would have to do it differently, perhaps put my leg under a train so they would have nothing more than a stump to stitch up. I slowly recovered my strength back at home. I had dropped from 9 stone to under 7 stone during the operations and wanted to give myself time physically to recover before trying again. But the leg became so infected that there was a danger of the bacteria getting into the bloodstream and killing me. I had so much fever I was sleeping 24 hours a day. My mum sat by my bedside, waking me every hour to make sure I was still alive. She has known about my condition since I was a teenager, but I know it shocked her to see me finally make an attempt. After nine months of agony, I told my GP that if I didn’t see someone fast, I would take off the leg myself. Within two days I had an appointment with a different surgeon. I already feel more complete now that one leg is off. I have always been an outgoing kind of person, but my confidence is much higher now as my body is more like I want it to be. For the first time I feel able to move on and lead the life I have always wanted. In many ways I am starting again. I know it sounds odd, but it is incredibly exciting. Running the house, doing the gardening, going shopping – these are all things I manage easily by myself, even though now I might use a wheelchair or crutches. My husband has been supportive. He thinks I look a little strange missing a leg but says that, after all he has seen me go through, he accepts it. For now, he is just happy that I am happy, and I have promised to leave the remaining leg on for as long as possible; I know that losing that will be really difficult for him. Only a handful of people know the truth about what I have done, and some of them call me crazy or mad. I suppose it is understandable. Even my sister doesn’t accept me as an amputee. She lives just up the road but hasn’t come to see me in months. In her eyes I am not a complete person any more. But I can’t let that affect me; the problem is more hers than mine. Removing the next leg will not be any easier than the first; the pain will be horrendous. But I have no regrets about the path I have chosen. In fact, if I regret anything, it is that I didn’t do this sooner. For the first time in my life, I can get on with being the real me. 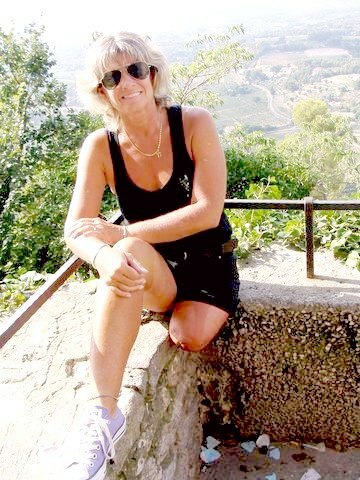 · Susan Smith is a pseudonymn. As told to John Cantlie. Thanks for finding and posting that, it certainly confirms for once and for all that she's a successful wannabe. Personally, even without the confirmation, there's never been any doubt in my mind. The sheer volume of material she's shared on the net - always (until recently) on crutches and flashing stump - shouted "Look at me, I did this and I love it"! I do feel for the husband though, especially if he's not a dev. She must have been a nightmare to live with both before she did it and after she succeeded, because I imagine her always wanting to be the centre of attention. Not to mention that (by her own admission) she may well try it again and possibly kill herself in the process. Think I'd be searching for the valium if I was him. Looks like one of the more recent pics. Still very attractive.